Celebrate Batman's 80th Anniversary with a special big screen event! 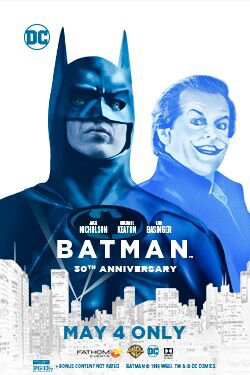 See 1989's classic Batman back for an anniversary celebration. Jack Nicholson is the Joker, who emerged from a horrible accident as a maniacal criminal. Michael Keaton is the Caped Crusader, who emerged from a childhood trauma to become a masked crime fighter. Don't miss this classic dark hero tale for an exclusive one-night event!